Hi! I joined this website in December 08 and I find it really useful. I work in a secondary school and I teach children from 11 to 19 years old, so my worksheets will always be very varied! 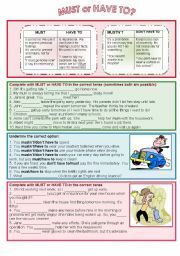 I´d like to thank you all for sending such great worksheets, my students find English much funnier to learn now! very easy activities to make sense of the comparative and superlative adjectives. This is the second of my worksheets devoted to the description of a person. This time, the students are taught some adjectives related to people´s character. There are some writing and reading activities for students to learn the vocabulary in a context. 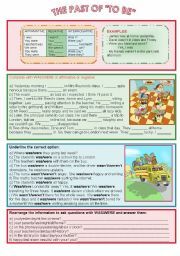 It´s a worksheet with a short grammar explanation on the use of MUST, MUSTN´T, HAVE TO and DON´T HAVE TO and some activities to practise. KEY included! 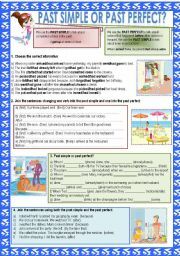 It´s a worksheet with a short grammar explanation on the use of the past simple and the past perfect. There are also some activities to practise. Key included! 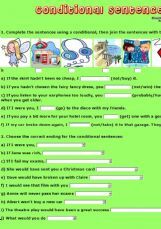 It´s a worksheet for students to practise the use of WILL and GOING TO for future predictions or plans. 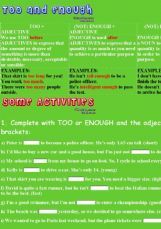 There´s a short grammar explanation and four different activities. I hope you find it useful! KEY included! 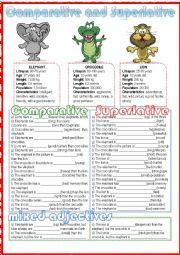 It´s an easy worksheet for students to practise the use of the comparative and the superlative form of adjectives in the context of animals. There are three animals and some information about each of them. The students have to fill in the blanks in the exercises. I hope you find it useful! The past of "to be"
It´s a very easy worksheet to practise the past of the verb TO BE. It has a short grammar reference and three activities to practise the affirmative, negative and interrogative. HAVE TO or DON´T HAVE TO? 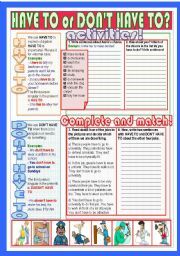 It´s a very easy worksheet for students to practise the use of the modal verbs HAVE TO and DON´T HAVE TO. There´s a short grammar explanation and some activities. I hope you find it useful. KEY included! 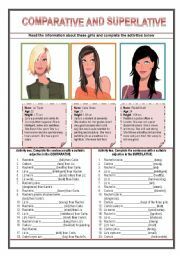 It´s a worksheet for students to learn how to describe someone´s appearance with guided activities. 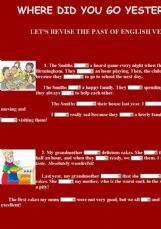 There´s a lot of vocabulary divided in family fields and some activities to read and write different descriptions. I hope you find it useful! 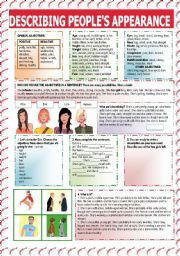 It´s a worksheet for students to learn more about travelling by plane. 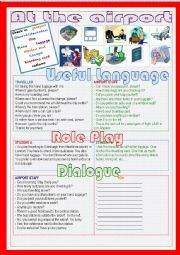 There´s vocabulary, useful language, a role play and a dialogue to complete. I hope you find it useful! It´s a PowerPoint for students to learn about indirect speech: commands and requests, questions and statements. I hope you find it useful! It´s a lesson to explain students how to organize the writing of a recipe. There are several steps they can follow and vocabulary, grammar and expressions they can use. It is a ppt version of one of my worksheets titles "my cookbook". I hope you find it useful. It´s a speaking activities for students to revise the vocabulary and expressions related to physical description and personality traits. There are some pictures to describe with hints to organize the student´s speech. There are also two slides for discussion. I hope you find it useful! It´s a speaking activity for students to express their preferences when travelling and to discuss some holiday topics. There are pictures to describe, opinion-based slides and agree-disagree discussions. I hope you find it useful! It´s a PowerPoint for students to learn how to describe a picture orally. There are some tips on how to make descriptions, some useful language and many pictures for them to practise. The pictures come with some questions to help students start speaking. I hope you find it useful! It´s an activity for students to practice oral production in class. They have some pictures and tips on how to describe them in a thorough, organized way. I hope you find it useful! It´s a ppt for students to revise the use of the connectors of contrast: although, nevertheless, however, though, even though, in spite of , despite. I hope you find it useful! It´s a lesson for students to learn and practice the use of relative clauses. 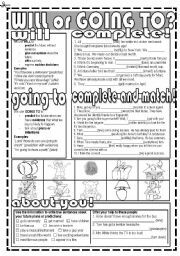 There is a first part involving some grammar with activities and a second part with speaking activities (you can also ask your students to write them). I hope you find it useful! It´s an activity for students to enjoy the Halloween celebration and revise some spooky vocabulary. They´ll also learn about some interesting traditions and superstitions related to this scary night. I hope your students have a frightening Halloween lesson! Enjoy. It´s an activity to practise TOO and ENOUGH in context. 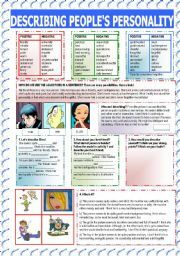 It´s a very easy activity for young students to revise basic vocabulary. 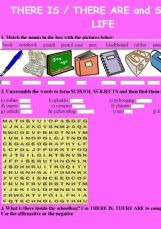 You can find colours, time, hours, fruit, vegetables, numbers, months, days of the week, jobs, prepositions, adjectives, family, classroom objects, school, school subjects, weather, ordinal numbers. I hope you find it useful! 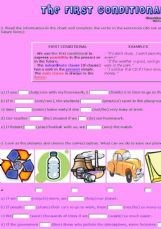 It´s an easy activity for students to revise the house chores. I hope you find it useful! It´s an easy activity to practise the past simple of English verbs. It´s an activity to practise the first conditional in the context of environmental issues. I hope you find it useful! It´s an activity to practise the third conditional in context. I hope you find it useful. It´s my fourth activity on conditionals. This time, the conditionals are all mixed. Students have to decide which conditional to use, the first, the second or the third. I hope you find it useful! with this OE students can practise the most common quantifiers: a, an, some, any, how much and how many.